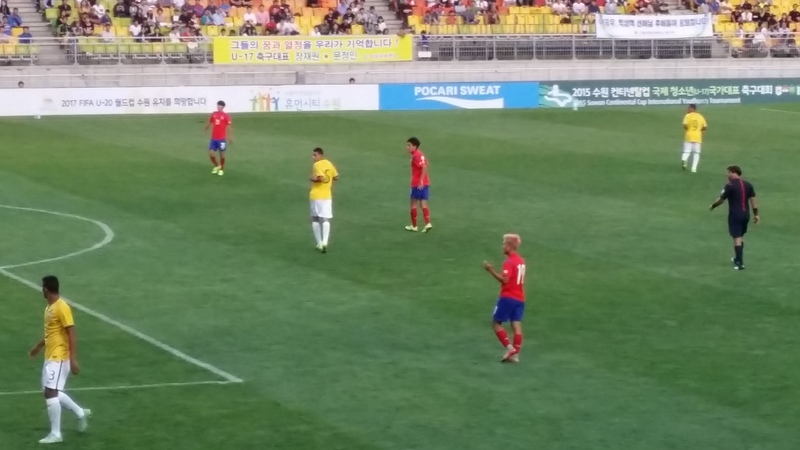 Are the U-17’s part of a bright future for Korean football? Korea are impressing in this year’s Under-17 World Cup, qualifying from the group stage with ease after beating Brazil and Guinea. The goal scored to beat Brazil has gone viral and highlights some of the great technique that fans of the Korea Under-17 team have been seeing a lot of recently. However, these players are still young and their footballing future is still unknown. Before we look at the U-17’s squad, it is worth pointing out that the national team is itself very young and will be reaching its peak in around 2018, just in time for the next World Cup. Son Heung-Min is still only twenty-three and almost all of the current squad will be under thirty years of age by the time that the next World Cup comes along. Manager Uli Stielike is more than willing to give youth a chance, as shown by his call-up of twenty-one year old Kwon Chang-Hoon who is still only in his breakthrough season at Suwon Bluewings. Just below the national team there are some other good youth prospects coming through such as Bayer Leverkusen’s Ryu Seung-Woo, and Barcelona’s Paik Seung-Ho. Out of the current Under-17 squad, there will be a few players who will make the step up and become full internationals, but at this stage in their careers it is hard to know who will make the leap to the national team. Take the Korean U-17 side from the 2007 World Cup for example. These players will be in their mid-twenties now and approaching the peak of their careers. While there are a few recognisable names from that team who have represented the full national team, such as Kim Seung-Gyu, Yun Suk-Young, Yoon Bitgaram, and Lee Yong-Jae, there are also players from that team who never quite made it as professional footballers. At the age of seventeen, the skills and first-touch might be present, but according to Arsenal boss Arsene Wenger, the understanding of the game is only just starting to become apparent, and the mental side of the game only reveals itself in a player’s early twenties. A seventeen year old can be technically gifted but lack the mental attributes that a professional footballer needs, and equally a less gifted player may be so determined and hard-working that they can make up for their lack of technical skill and break into the national team at a later stage in their career. This point can be seen when looking at Korea’s final group stage opponents. From England’s squad for the 2005 European Under-17 championships, only Theo Walcott has so far managed to earn a full national team cap (although if not for his tragic heart problem Fabrice Muamba would have probably also earned an England cap by now). At the same time, England’s current squad contains players such as Chris Smalling and Jamie Vardy who started their careers in non-league football. For Korean football to reach its full potential, it needs to find these forgotten players, the ones who didn’t make the under-17s squads and didn’t play for Maetan High School. From Korea’s current Under-17 squad, there are certainly some players who are doing themselves plenty of favours with their performances in this World Cup. Much of the attention has been on Barcelona’s Lee Seung-Woo, who has a huge year ahead of him and needs his critics to remember how big the jump from youth football to professional football is. It may take Lee some time before he fully adapts to the demands of professional football so Korea has to be patient with him. It is also worth remembering that Korea’s goals against both Guinea and Brazil didn’t involve Lee Seung-Woo at all, and that the rest of this side has plenty of potential. It might be hard to know exactly which players will make it as professionals, but there are definitely players in that team who will go a long way.